PhD student Aubrey Dugger’s work is featured in the Spring 2014 edition of Bren News (a publication of the Bren School of Environmental Science & Management). 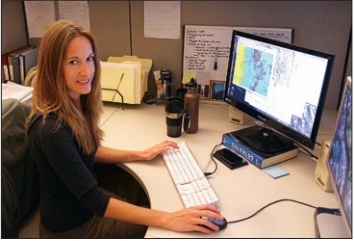 Aubrey has worked with Dr. Tague for the past five years, adding new functionality to the RHESSys model for the complex modeling work she is conducting in the Santa Fe watershed, addressing optimal thinning practices to maximize water yield – and considering management under the impacts of climate change. RHESSys users will also benefit from Aubrey’s work, which capturs fine-scale processes and their aggregate effects, as it has been embedded in the model and can be used in future research.